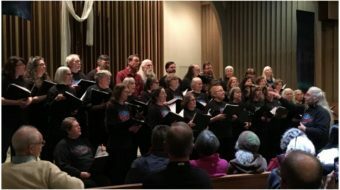 OAKLAND, Calif. – As dawn broke over Kaiser Permanente’s flagship Oakland Medical Center on Dec. 11, pickets with bright signs saying, “Don’t deny my patients mental health care” were already marching and chanting in front of the facility, drawing honks of solidarity from passing cars. The marchers were mental health clinicians, members of the National Union of Healthcare Workers (NUHW), protesting the long waits their patients must suffer between appointments, in sharp contrast to the prompt scheduling generally experienced by patients with physical illnesses. 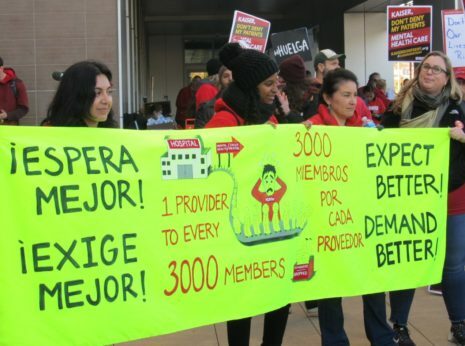 Oakland’s picketers were among some 4,000 psychologists, therapists, social workers, psychiatric nurses and addiction medicine specialists throughout California, striking the state’s largest health care provider for five days, Dec. 10-14, and affecting over 100 Kaiser clinics and hospitals. Their demands included stepping up levels of mental health care staffing, as well as compensation matching that of other unionized Kaiser staff. The NUHW workers have been without a contract since the end of September. 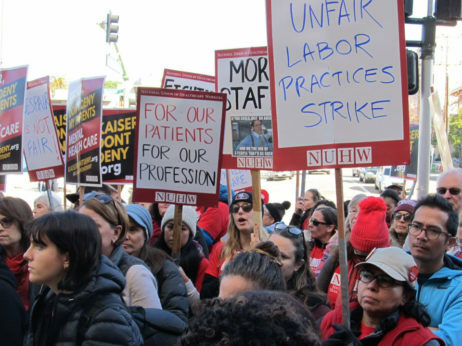 At noon, over 500 clinicians, union and community supporters – including members of the California Nurses Association and Stationary Engineers Local 39 who struck in sympathy with NUHW – joined in a spirited rally in front of the hospital. Calling mental illness “a public health epidemic,” he told the strikers that while they are supporting their patients in seeking timely care, they are also raising an issue that’s largely being ignored around the country, and that suffers from the shame and stigma which often affects patients seeking treatment. 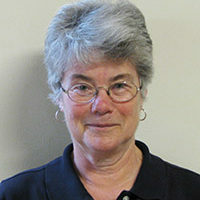 Kennedy, a former U.S. Representative from Rhode Island, called equal treatment for those with mental illness a civil rights issue. 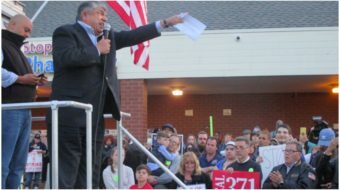 H recalled his role while in Congress as a principal sponsor of the 2008 Mental Health Parity Act “that said the brain was part of the body – a radical notion.” That legislation requires equal access to care and bans higher premiums and copays, and other forms of discrimination in care. Jessica Dominguez, a licensed marriage and family therapist at Kaiser’s Richmond facility, called attention to the disparities faced by Latinx patients, with services in Spanish even scarcer than those available in English. NUHW says Kaiser has a history of forcing patients to endure long waits for therapy appointments. In 2013 California’s Department of Managed Health Care fined the system $4 million for violating the state’s Mental Health Parity Act, and after finding further violations in the following years, the agency required Kaiser to accept outside monitoring of its mental health services. 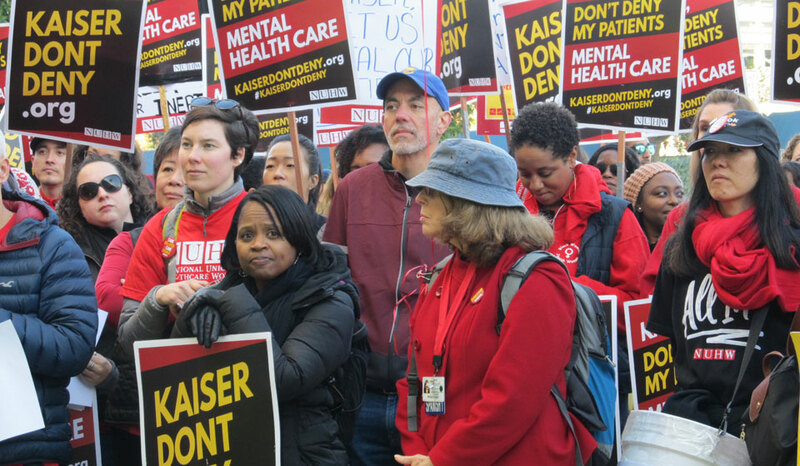 The union points out that Kaiser has one fulltime clinician for every 3,000 patients – a ratio unchanged over the last three years. In a conversation after the rally, licensed social worker and NUHW Executive Board member Clement Papazian said the problem of limited and poor access to care creates “all kinds of chaos” as patients’ conditions deteriorate. Over time, Papazian said, the whole system starts to break down, with people failing to improve, or dropping out of care and therapists trying to see their patients with the time they have but lengthening the intervals further and further. The day’s action concluded with a town hall meeting featuring patients’ family members, clinicians and area political leaders who discussed California legislation to assure care is equal for both mental and physical health. That story will follow.